In Botswana, elephant and humans are in conflict, especially in the rural areas where villagers try to grow crops close to elephant habitat. In the Okavango Delta region, one of the countryís last major wildlife sanctuaries, the perception of elephants is very negative and most children have experienced or heard about elephants destroying crops or injuring people. At the same time, ecotourism continues to develop in Botswana. Unfortunately, most Botswana citizens do not yet view tourism as a career and few have access to tourism facilities. The Elephant Outreach Program is a conservation education program offered to children of the Okavango Delta region. Village children too poor to attend school and Maun pupils ages 8 and 12, experience a two-day outreach program with an environmental teacher at the field station. There they learn about elephants, wildlife and tourism of their country through educational games. The participants can then share what they have learned with the other pupils of the environmental club of their school or with the other children of the village. 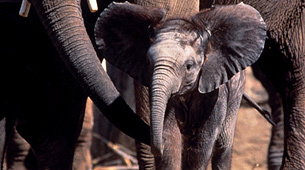 * encourages parents, through the experiences of their children, to reconsider their negative opinions about elephants.